One more thing for your to-do list! All right ladies. I’m back. It’s only been a second since I splashed up my last post, and yet here I am – back with you again. This time I’ve taken laptop in hand to deliver some grim news. In a mere week, your daughters will be hanging upside down from the monkey bars in their cute new skirts. I know you’re still stressing out about which child needs the box of 12 crayons and which one was supposed to have both the box of 8 AND the box of 24. You’re putting it off and trying to not think about the lines at Wal-Mart. But you know perfectly well in the back of your mind that if you don’t muscle your way on out there, then you’ll arrive too late and the number 2 pencil section will be completely ravaged. And then there’s the back pack question. And the school shoes. And the back-to-school haircut. I know you’re preoccupied with all these things – but the fact remains. Your daughter will be looking just adorable and preppy, and she’ll have her monogrammed backpack and her little hairbow and her number 2 pencils, and you’ll breath a huge sigh of relief. But then she’ll sit down on the floor by the door to tie her shoes. That’s the moment to look out for. That’s the moment you’ll wish that you had ordered a Skirty. So go for the gold, be organized, and order one now! And feel a little thrill of gratitude that you didn’t have to stand in line at Wal-Mart to get it! In fact, you can find one right here. Last chance at the Giveaway! My girls LOVE their skirties! And more importantly, I LOVE their skirties for them! No more worries about them showing their undergarments to the world every time they sit down, roll around, or do flips. They are wonderful. My only problem is I wish I had 3 for each of my girls! In serious nesting-mode with two days away from my due date. I’m getting that bed-skirt for my daughter’s bed, a cracked basement window replaced, gutters cleaned out and skirty ordered. Thanks for the reminder. Been meaning to do that for months. 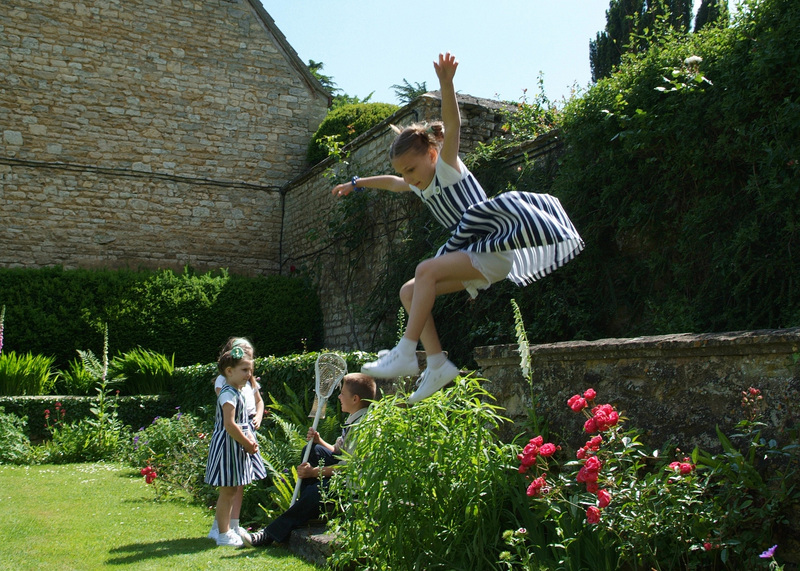 My daughter doesn’t have any skirties, but she would LOVE to jump over the stone fence!